Making a big change in your career can be scary. In this episode of STC, Jon and Nicole talk about the times they decided to take a leap and the times when they decided the timing wasn't quite right. They also tackle: Is there anyway to know you are truly "ready" to make a big change? - The risks and perceived risks that come with making big career changes. - Is there anyway to know if you are truly "ready" to take a leap? - Emotionally dealing with leaving a team behind and why we are all a little less important than we think. The best we advice we have is to trust yourself to make a hard call if you've put in the work. Talk to people you trust around you. Get some feedback. Build your savings account if needed. But at the end of the day, making a big change is an emotional decision that's on you. Taking a big leap can be scary. Drew Hudson, co-founder of Dropbox, says he considers which path to take based on what will lead to obtaining the most knowledge or is the most interesting to him. We like this way of thinking because it can lead to taking on work that you haven't done before but have always wanted to try. Nicole is a former PPC analyst, department head, and product manager. She focuses on marketing and customer success. Spent years as a PPC consultant and agency analyst before focusing on making software. And this is our podcast Shape the Conversation. Nicole and I work with a great team here at shape.io headquartered in Bend Oregon. So we left our agency jobs as marketers to build software for digital advertising teams. We'll be talking about working in marketing and growing shape.io on this podcast. Our goal is to just, like Nicole said, talk about what we've been through and hopefully impart some valuable advice or at least something for you to think about as you go along your day to day and shape your own conversations. Why should you listen to us? Well we're a software company that's been able to reach profitability, we're outside of the Silicon Valley bubble, we did raise money in 2015. So we've seen the bootstrap side and this side of it too. So we've got a lot of different perspectives on how to attack different problems. And on this episode Nicole what are we going to be talking about. So we'll be talking about how we made the decision to strike out on something new. So for you it was really about creating you know the first iteration of shape.io which was called Steadybudget at the time and may have even had another name before that. And for me it was really about leaving a pretty comfortable solid job, also three months pregnant to decide i'm going to go work for a startup. Yeah. So it's the week of July 4th America's independence. America made a big decision make big change in their history. So that's what we're thinking right. Like how do you make a big change? How do you decide that it's the right time to either make a jump or make a change within your company to do a new job? What kind of things do you look at in your own life to let you know that you're ready or maybe not ready or if the opportunity is really there. So I think all we can do is really talk about it from our perspectives I think from the outside looking in what we did me and leaving a job to start a company looks like a really risky thing to do on the outset. You leaving a pretty comfortable job a place you've worked for six years to come work at a newer company. Eight and a half years. Looks really risky at the outset. But I think breaking it down like some of the moves or big moves you see people make maybe aren't quite as risky as you see at the outset. So you are working at an agency moved through kind of the analyst jobs to the product jobs. Talk me through, were you at where you wanted to be in your career? Like what type of things did you look at when when you wanted to make the push or the change? Yeah. So for me it was a combination of wanting to push myself into something new and needing to be in a better spot just with creating a family at that point in time. So as Jon mentioned I had gone from just a pay per click analyst to a senior analyst to a manager. So I really felt like from my agency role I had fulfilled that kind of career path. I will say this, I would have liked to spend a little bit time more time being a manager and really kind of building out my skills there, but as anyone who has managed a department knows and especially digital advertising where you're running into a lot of different I mean the industry is always constantly changing and you're managing a team that's always constantly changing it can wear you down. Everyone that I know that had that opposition has had it for about two years before they moved on and that's about where I hit. So I decided at that point I wanted to get into product management and my goal really in product management was to make everything I could better for the department that I came from. Now that was probably a little bit of a naive understanding of what product management was and how much impact I'd be able to have right away. Yeah I think the company we came from and both worked for, I left in 2013, you left just last year or so plus, their digital marketing also with the software kind of platform. So there's a lot of interesting opportunities to bounce around and find jobs within product and being an analyst and you were able to kind of explore a lot of different things. Did you feel like being able to try some of those different jobs in the fast growing startup and also it was a great place to work. And that almost makes it harder sometimes to leave a place when it's a really great place to be and work. I adored every single one of the people that I worked with. Even the people who I had you know not necessarily easy relationships with especially being in a manager role you have to deal with you know personalities that aren't necessarily in line. I'm a Type A personality not everyone I hired was, even working with all those people I absolutely adored every single person that I worked with. My difficulty my learnings my kind of experience really came from having to go up against things that I wasn't necessarily prepared for or expecting both in management and a product management role. One of the things of product management where I kind of felt that was a guiding presence to me being able to be ready to leave my job is I was able to push a couple of things forward in a way that I felt happy with what I had executed to a point. But I was running into a lot of continued walls and so I did what I could, I released what I could, I felt good about that and I made the decision that I had helped my team I had reached what I could to help my previous team achieve and that I wasn't going to able to necessarily push anything forward in a substantial way which made me comfortable with the decision to leave. Now that wasn't what motivated my decision to leave. I think that's a big piece of it though. That's one part of feeling like you're ready to make a big change or make a shift is that where you're at you're not leaving in chaos. You're not running away from something. Absolutely and that's one of the proudest things that I did, at least in my manager role for my digital advertising team is I felt that I really successfully set up that team with a manager who I knew could execute and shepherd the team and that would continue to push the team forward and that person did. That person made a lot of big strides that even I wasn't able to accomplish and so I felt I felt really good about that. Now that was the manager role. So you know from the product management role that was a little bit different. But it just that was the case. How do you think about where the team you're going to be leaving is because I think a lot of people have guilt that "I'm such a integral cog to this machine. They're not going to be able to survive without me!" but what I normally tell those people is that you're maybe not as important as you think, that the teammates around you are probably going to figure it out. I know as I was transitioning out one of the harder things for me emotionally to take was you know you make the announcement a month or two later you're going to leave so like two weeks after their announcement that you're going to leave they start to you know not invite you to meetings anymore or you don't get as many responsibilities around the office and by the time you leave you start to figure out like, "wow they're going to be fine." and that isn't always easy to take or accept. So there was one... I may not be the norm but there was one concept that my dad always taught me and my dad, actually both my dad and my mom have been in business specifically you know kind of like technology sales or insurance sales from the very start, and the thing that they taught me was that you are as a manager not as important as your team. You need to do everything to uplift your team you need to do everything you possibly can to give your team credit and not take it yourself. And so I always had in the back of my mind that I was never as important to my team and did everything I could. Now that being said there were a lot of things that I did that I felt like who's going to take over this job who's going to do this. How am I going to impact or impart more work on my team than they're already taking on because our team at the time had a huge burden on their shoulders. Now that doesn't mean they weren't strong as you know all get up and couldn't take more on but I felt more guilty that I was putting more undue pressure on them to take on more work because hiring a new manager or shifting people around in that space isn't as quick as you think it's going to be. You're like oh yeah we'll just promote somebody and then somebody will move into their position. No It's not a quick two week process. That's kind of what blows my mind that we give two weeks notice and then we move on in both the case where I moved or got promoted from a manager to product manager I think that was a process of a month and then actually leaving my job as a product manager at my former agency, It took me two months because I wanted to try to put them in a better position to have a new product manager come in be able to take over my projects and my roles and etc etc. And I still don't think they had hired someone by the time that I left. So I mean kind of circling back to around to your question. You have to have your mind set that they will be fine and even if they don't hire someone into your role things will shift they'll eventually make it work or they won't. You know there's some cases where they won't but you have to believe if you work for a stronger organization and you put enough hard work into building that organization up along with all of your teammates of course that it's going to be fine. And when we kind of started down the path you said actually you were kind of looking to make the move for family reasons and to that I think some of that could be counterintuitive. You know like why would you leave more of the steady job that you have already to jumped to more of maybe an unknown smaller company? But I think that that's a little bit of a misnomer too is that people think, "oh I'm going to jump to a smaller company I'm going to have to do everything I'm going to have to do X Y Z." But actually you're on a smaller team, there's less meetings, there's more flexibility in terms of when you might be able to leave the office at 3 o'clock as opposed to managing a team of 10 or 11 where you have to be present more often. And I think some people look at moving to a smaller company as a bigger risk in a lot of cases it can give you more freedom it's not necessarily now you're going to be shouldering way more of the load than you were at the bigger company. Yeah it was definitely an adjustment. I mean three months pregnant you don't typically say hey I'm going to give up a job that I've had for eight and a half years where I'm making a great salary, I've got great benefits, I really love all my co-workers, I think I've kind of figured out stuff now that being said along with that I had a lot of stress that I had decided probably wasn't necessarily super healthy for me and it was funny because I did move to a job where I was like, I know Jon, I know the people I'm working with, I know the product because I used it as a consumer. But I don't know what I'm getting myself into am I taking on more work am I taking on a whole set of different challenges? Is this going to impact me more? I ultimately you know over a process of a couple of months decided that it was the best decision for me and that I needed to make that jump and I was ready I was ready to take on challenges that were outside of what I was currently working on. So that was kind of my stories. So let's dig into that. Are we talking old school pro con list? Take me through that process. You're saying you feel like you're ready. And I know how I kind of go about this to determine if I'm ready to make a big change or something. But what's your process? Yeah it was it was a pro con list. I was talking to a lot of my advisors if you will so it was my husband who's in a completely different field but has been in business in the working environment 5-10 years longer than I have. Okay, he's not that old but talking to my parents it was talking to Jon actually having conversations with you. Making sure that I was comfortable with you know where I was headed. It was really planning out how I thought I could make an impact on Shape and feeling really confident about that you know it was a big shift for me going from a job where I wasn't in product management for many years so I can't even say that I was really that good or even mediocre of a product manager to a place where I felt like I could make a bigger impact and faster than I could in my previous role. Yeah. And I think if you look at some tech leaders or thought leaders out there how to how do they approach this. How do they think about big decisions in their life. One that always sort of stands out to me is Drew Hudson of Dropbox and what he talks about is when he's trying to make big decisions or decide what to do he tries to optimize for learning. So he thinks, "Okay, am I going to learn the most choosing path A or path B?" And I think that's an interesting at least first filter to think about in terms of learning. Now there's salary, there's real life concerns about all these things but learning is one thing especially when you're trying to build a career and look that I think is an interesting idea to optimize for. Absolutely and I came from a very specific PPC digital advertising background and the idea of being able to take over an entire startups marketing efforts and then eventually that led to customer support and there was a whole host of things that I had never really done in an official capacity that I was really excited to learn and take on and get to you know be able to devote hours a day learning to that and not feel guilty about that. It was kind of huge. So that was definitely something that motivated me or interested me in this position. Yeah I think when I was looking to make a job or make that big change when I was looking to go out on my own and take my little nest egg and try the start-up life and go for it I think it's really one of those gray area type decisions that you really don't know if you're ready or not like you think you are ready you do pull the trigger and make the move. But what I always like to say is CEOs the easiest job to get, period. Because you could quit your job and tomorrow be a CEO. LLCs cost 150 bucks to set up. COE is a really easy job to get yourself into. Now the guts to like pull the trigger and go for it is a little bit tougher but I think it's you gotta trust your gut a little bit sometimes when you're making those big calls. So what made you comfortable with pulling that trigger finally? What let you know you were ready? I think there's a couple you know black and white things that helped. I've spent a lot time consulting saving some cash. I knew I had about 15 months of runway where I didn't have to make a sale period. And I could still work on this thing every day all day. It turns out it took twice that long. So then a year into the runway had to get creative and figure some stuff out but in my head my goal was give myself a year of time to at least work on what I wanted to work on every day full time. And I really leaned on just my gut in a lot of ways and I don't really think there's a firm set of checklist you can go through. I think you can read all sorts of statistics like 0.01% of all startups make it to whatever you know path or profitability or whatever and you can think about those things but I hate those stats. I'd rather be like okay what are the stats for a B2B type company that already has a couple of customers lined up that has the developers ready to do it. What are the stats in that situation? And you're never going to really get that. When I was in my 20s, now I'm almost 35, when I was in my 20s talking to guys that were in their mid 30s being like "oh what's it like to be so old? How do you navigate life pre marriage, pre kids anything?" and they just say like, "Don't worry about it too much like you'll know." And I think that's what I honestly felt through those times was that it wasn't necessarily like any tangible thing lining up it was just something like if I was listening to that little voice in me and like it knew like hey it's time to go for it or now's the time. So there wasn't anything on your mind holding you back at that point? I think you've got all the normal fears like your paycheck all of a sudden not being there is a fearful thing. I think when your job is such a big part of your life and your paycheck tied to that you find a certain amount of worth in it no matter how much you want to say you don't you find worth in your bank account and how much it has in it and going down the startup path killed any of that type of you know tying myself to my bank account. I think that's one of the things that I've found most energizing through the process of even not making sales and watching the personal savings go down was that still at the end of the day I was pretty happy. And I was engaged with what I was working on and I began to start to focus more on those feelings than necessarily the bank account because you have to. I think there's something to be said to feel like you are building your product that is helping people out in some sort of tangible way. And even the iteration of before Steadybudget, which is now known as Shape, was in the case I feel like you know us talking about our product even when it existed it felt like it was going to have a tangible benefit. Now that's not to say that everyone who has an idea for a SaaS startup doesn't have a tangible benefit and like you said I mean there's some percentage that isn't going to go anywhere. But I think that's one of the things that I recognized even when you were first started this journey is how excited you were and how much I could see, because at that time I was still managing a team, that there was some benefit to our team and that's why ultimately we became one of the first customers. And so on and so forth. Yeah and I think that's one of the things too to think about as you're debating a big changer a big shift in your day to day. Can you find one other believer, can you find one other believer that's within your family circle friends circle that kind of think it's a good idea? Okay that's a good hurdle. Now if you're thinking about starting a company that is going to rely on revenue can you find a believer that's going to pay you? Okay they still might be in that friends or family circle. But can you now find somebody outside of that friends of family circle that finds value and is going to pay you? Now you're down the rabbit hole a little bit more that's the reality of what it's like if that's a business idea you're trying to take on. Well then you get to the can you find someone who believes in their value and is willing to work with you and then commit to that too. That's another step. Huge hurdle really tough like I honestly respect the second person that comes on board at startup's probably more than I respect the first person that comes on board in a lot of cases because it's that sort of person that likes seeing the belief seen the vision and believing it that that takes just as much courage as the first person. Courage and I think drive I mean you have to push that CEO or whatever they've deem themselves at that point to to continue to push the company forward in ways that they might not necessarily be comfortable with. You may be coming into a position to be a little combative right because you're going to share the general vision and the general drive but maybe there's some disagreement and that's why I mean obviously you see with Microsoft with Google with all these places like employees 1 through 20 are just like rolling in the dough to the point of a noxious-ness. I mean I'm sorry I want to be you, like still because it's a hard fought battle it's a really hard fought battle in that first push that first getting profitability or getting to whatever your goal is whether it's IPO or etc..
And I think that's what you need to be thinking about if you're looking to make a move from a bigger company to a smaller company. You're going to be asked for your opinion more opinions are going to matter more. You're going to be able to have more autonomy over the changes and I see Nicole give me a face that's why I'm slowing down. And I think that's what you wanted and that's what to you were craving when you were honest about it. And I think that's if you're looking to make a big change or if you're trying to make a decision within your life to make a change to take on a bigger challenge or to switch jobs or to start a new project what do you want? It might scare you a little bit but you've got to be honest with yourself about what you do want and if you're not listening to yourself and really having the guts to be true to what you're saying you're want you're not going to be as good of a person to be around. You're not going to be as good of an employee at your current job. The worst thing you can do is stay in that like middle phase of being like, "I think I want this other thing but I'm going to stay here in the meantime." I knew that I always viewed, for a stretch, my day job as like a vehicle and an MBA to like teaching me what was going to help me start my own thing. Like I always had this idea that I was eventually going to start my own thing. So I kind of put my day to day in that lens. And I viewed even like going to work today at the day job even if it was tough I started to look at it like hey what can I take ontoday that's going to learn and bolster me going forward when I have my own thing. And if things were moving slow or there are things I didn't agree with instead of really getting frustrated about it I was able to have this distance from it because I was just kind of filing it away be like All right this is great I'm glad I've got to experience this because I'm going to learn from it and change that environment in the future. And I think being able to identify what makes you unhappy about your day to day if it's really your job if it's what you're doing and being able to identify what would make you happy because that's always the tough thing. A lot of people are unhappy with their current situation but they have no vision or they have no idea of what that next thing they want is so be able to really articulate what it is you want and then you can start putting everything that happens to you through that lens. I think that's good advice. I don't really have anything to top that off. Alright. Let's wrap it there then. How about that? Well this has been another episode of Shape the Conversation. Hope you guys have got some things that you can take to shape your own conversations through the week. You know what to do. Subscribe and one thing, so a lot of podcasts that I hear they're like, "Go rate us five stars. You know we want 20 more 5 star ratings." Who's going to be our first rating on iTunes. I know we've got some listeners out there. We've got no reviews on iTunes yet. Who's going to be the first one to review shape the conversation on iTunes you have a chance to make history here. I said nothing about 5 stars. I just wanted one review. I can handle criticism. Yeah, but you added in with like you know a lot of people say give us 5... No, be honest. Let us now. Not pressuring you in any way. So until next week hope you guys had a great Fourth of July, and over and out. Reach out to us with any ideas, questions, or feedback on the podcast! This episode was produced by Max Bettendorf. 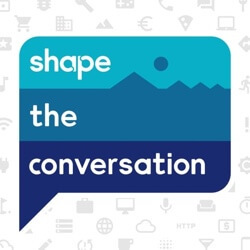 Checkout other episodes of Shape the Conversation.